Congratulations to "Martha L.", the winner in Leigh's giveaway. Please contact JUST ROMANTIC SUSPENSE to claim your prize. Thank you to all who participated! A couple of years ago, I wrote WHATEVER YOU SAY, a contemporary romance set it in the fictional town of Highland Springs, West Virginia. The story is full of quirky, interesting folks who make up the fabric of small town life. But there were two compelling secondary characters that stood out in the story, piquing my readers’ interest. Derek Bronson, the hunky, FBI special agent and Riley Smith, the quiet, mysterious next door neighbor, were destined to have their own book. STAY HIDDEN, published by Soul Mate Publishing, is the first of three romantic suspense novels in the Hidden Series, and features Riley and Derek. All three books are set in central West Virginia, an area I know well having gone to college in that part of the state. The beautiful mountains, the rugged terrain, and the simplicity of life make for an interesting backdrop to murder, kidnapping, and abduction. For FBI agent Derek Bronson, Riley Smith isn’t the girl of his dreams. She’s better. Until she’s the prime suspect in his father’s murder. It was him. She would recognize that voice anywhere. How had he found her? She had been so careful this time—kept a low profile, changed her long hair to blond, only paid in cash, replaced her track phone every couple of months. How had he traced her to Highland Springs? Stars danced in front of her face. She blinked a few times as the keys clattered in her hand. Her vision cleared, and this time when she cast a look over her shoulder, she didn’t see a memory, but a dark-haired teenager who looked nothing like him. He didn’t even sound like him. Riley sagged against the screen door as the old pickup pulled away. She trudged to the edge of her porch, sank onto the top step, and dropped her head into quivering hands. Another false alarm. Her mind, yet again, playing tricks on her. When would she stop seeing his face, hearing his voice? Not until he slipped up and was thrown in jail. Until then, she would keep facing the fear she’d had since leaving Kentucky. She’d keep feeling it—and she’d keep running. 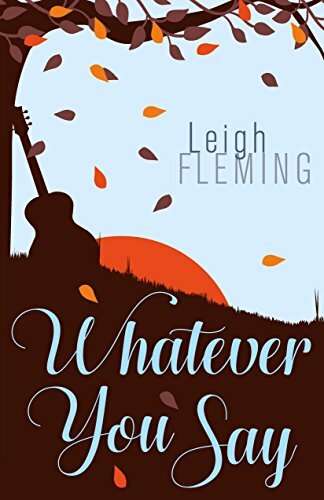 Leigh is giving away a Kindle edition of Whatever You Say and a $10.00 Amazon gift card to one lucky reader posting a comment. Leigh Fleming creates unique characters facing life’s challenges but who are always rewarded with their happy ending. 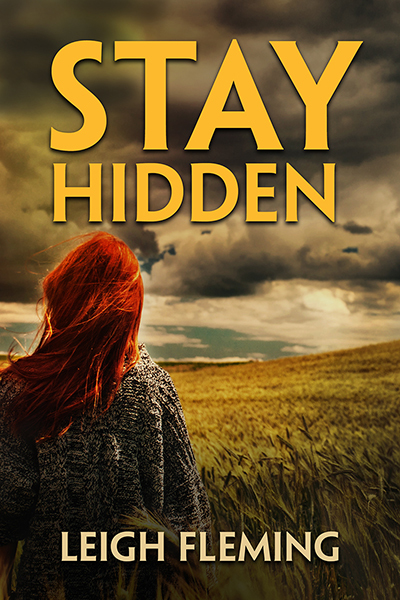 Stay Hidden, the first in her Hidden series, won the Lone Star Writing Contest for romantic suspense in 2017. Giveaway ends 11:59pm EST June 5th. Due to GDPR regulations you no longer need to submit your email address in the comments. If you have been selected as a winner your name will be posted at the top of the post. You may then contact maureen@justromanticsuspense.com to claim your prize. Your email address will be shared with the author/publicist providing the giveaway. Can't wait to read Stat Hidden! It sounds great!! Stay Hidden! Sorry! Small keyboard! Hi Sue, I hope you'll enjoy Stay Hidden. Thanks! Thanks for sharing the excerpt, sounds like a great read! Hi Ada, I'm glad the excerpt sparked your interest in Stay Hidden. Thanks! New to me author. Always looking for new reads. Book looks great. Thanks for the chance. Hi Christine, I'm glad you "discovered" me. I love your avatar. Matt Bomer was my muse in an earlier book WHATEVER YOU CALL ME. Hi Kim, I'm glad you enjoyed it. Thanks. Both of your titles draw me in and raise a lot of questions! Hi Janet, questions are good thing. I hope you get a chance to read some of my books. Thanks. I haven't read a good suspenseful book in a while, so really looking forward to "Stay Hidden". I love quiet and mysterious heroines. Hi Natalija, I hope you'll enjoy unraveling Riley's mysterious past in Stay Hidden. Thanks! Hi Ami, Thanks for the good wishes! "Quirky, interesting folks" works for me. Hi Mary, I love a small town story, don't you? Thanks. You are a new to me author! Love finding them and their books. This one sounds wonderful. Congrats on winning the prizes. Be sure to send you email address. I'm glad you "discovered" me. Thanks! Suspense was the first genre I read, even as a child (if Nancy Drew could be considered suspense for that age level). Domestic abuse is a major problem in our country. Both men and women, also children, are fearful of leaving an abusive relationship because of the response of the abuser. Those that do leave, must protect their location and those dear to them. Abusers consider their victims their "property"and will often do almost anything to get them back. WHATEVER YOU SAY sounds like a good exploration of this and the effect it has on the victim and those around her. I would imagine most of us have known someone in a domestic abuse situation. So sad. I hope you get a chance to read Stay Hidden. Thanks. I really like the cover. Looks like a good book. I was excited about the cover, too. Thanks. This sounds really intriguing! Thank you for sharing excerpt from the book. Looking forward to read it! Hi Dee, I hope you enjoy Stay Hidden. Thanks! Love finding new authors. I definitely will check out these books, sounds like great reads! Hi Ania, I'm glad you found me and will enjoy Stay Hidden. Thanks! Hi Joyce, I'm so glad! I hope you get the chance to read Stay Hidden.